At the moment I’m so hot for free financial podcasts that all the episodes for all my other subscriptions have been piling up like mail in a holiday home. I snapped out of my money daze to listen to the episode of Reply All you mentioned. I agree with most of what you said about Reply All – it took me a few episodes to get into it, but it’s really in its stride now. But I’m not sure the latest episode – Love is Lies – is the best. I mean, it’s really good and there’s yet another ‘how did they get THAT person to talk to them?’ moment. So what was the best? Hmm. I thought Anxiety Box was fascinating and Jen overheard me listening to The French Connection, and she stopped what she was doing to take it all in. One of those two. Before I tell you about a podcast you might be able to obsess over, I’ll mention a few ones I want to delete from my app. I tried a podcast about video games called ‘The Indoor Kids’ and that goes right into the meh category. I’m in the market for a good podcast about video games if you ever find one (!). I’ve also gotten rid of The Economist podcast. It’s fine and good and whatever but just a bit meh. Can’t even be bothered to try to explain it. Lastly, I got shot of The Disciplined Investor – one of millions of financial podcasts that talk about nonsensical financial chicanery like predicting stock prices with charts (insane), how to do daytrading (foolish), how to trade options (might as well juggle dynamite) and all that type of toxic fluff. Okay, now something for you to listen to. 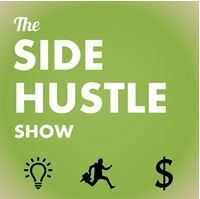 I insist you go and listen to The Side Hustle Show. You’ve heard me make oblique references to various new projects I’ve been working on. Well, what happens is, I listen to an episode of The Side Hustle Show about buying and selling websites and I get all excited about that. Then the host, Nick Loper, interviews the number 1 expert in the world of SEO optimisation and I think ‘whoo! I can do that!’ and I get PUMPED about fiddling with keywords and stuff even though I don’t really understand it. Then it’s an episode about making money on Youtube and I think ‘ROAR LET’S DO IT’. I’m not sure which episode would work for you as a good starting point. Go to the feed and scroll down till a title catches your eye. I’m very curious to know if you end up catching the side hustle bug too!